Baby born with alien features. Deformity or something more? 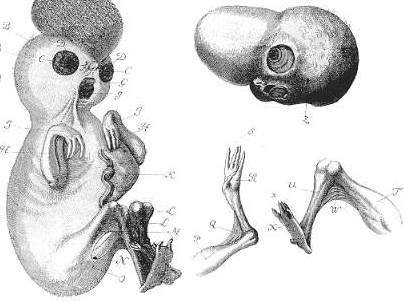 In 1735, a delightful 28-year-old German woman named Johanna Sophia Schmied gave birth to a monster unlike any creature we have seen before or since. Today, some people believe the baby was on the threshold of being an actual alien. Obviously this is a far-fetched idea. What do you think? If you are extremely curious, you can visit the creature preserved in formaldehyde in a museum in Waldenburg, Germany. 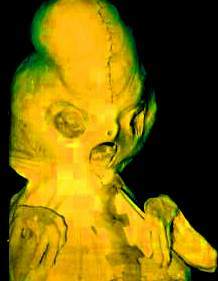 Some people believe that the baby is evidence of genetic manipulation by extraterrestrials, "abandoned when the results did not meet their expectations." Whatever the being's origin, photos of the baby seem to elict strange reactions from observers. Most people are either repelled or so mesmerized that they cannot help staring into the baby's eye sockets for an extended period of time, while feeling an unnatural dread, a creeping feeling of despair and isolation. Johanna had several healthy sons prior to birthing the alien. After the initial autopsy, a Dr. Friderici wrote a 32-page report in Latin that described the baby in exquisite detail. Dr. Friderici hired an artist to make the drawings, one of which is shown here. The oversized head was not hydrocephalic and was completely filled with brain matter. Other strange births are discussed here. Further Reading on "Monstrum Humanum Rarissimum"